BRITISH lawmakers on Friday rejected the Brexit deal proposed by embattled Prime Minister Theresa May in Parliament for the third time, throwing the UK’s divorce plans with the EU into further disarray. MPs voted in the House of Commons against the terms of Britain’s so-called divorce from the European Union (EU) by 344 to 286. An approval would have given the British Parliament time until May 22 to get all the accompanying legislation passed. The key vote took place on the day Britain was earlier scheduled to exit the bloc, until the EU leaders granted more time. According to the EU, the UK must present an alternative proposal to leave the bloc by April 12. As the MPs rejected her deal again, the prime minister, who had offered to resign if her Brexit plan was passed, must set out a new plan by April 12. 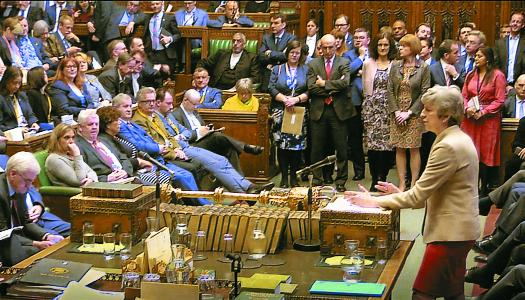 Commenting on the outcome, May told MPs: “The implications of the House’s decision are grave. I fear we are reaching the limits of this process in this House. This Government will continue to press for the orderly Brexit that the result of the referendum demands”. She said that MPs would debate alternatives next week. In the past, the House of Commons rejected May’s plan twice, both times by overwhelming margins. Hours before the vote, London Mayor Sadiq Khan called on lawmakers to reject May’s Brexit plan and negotiate a new one with better terms. The UK triggered Article 50 of the Lisbon Treaty following a referendum in favour of Brexit by nearly 52 per cent to 48 pc in June 2016. EU calls crisis summit: THE EU on Friday, summoned leaders to an extraordinary summit, warning that Britain is now “likely” to crash out of the bloc on April 12 without a Brexit deal. “In view of the rejection of the Withdrawal Agreement by the House of Commons, I have decided to call a council on 10 April,” tweeted Donald Tusk, the head of the European Council. Almost immediately after the House of Commons voted to reject the withdrawal agreement, an EU Council official said Brexit would be postponed until April 12, as decided at a summit last week. Britain’s Prime Minister Theresa May is expected to draw up an alternative plan for an orderly Brexit before then, and will be asked to present it to her 27 EU colleagues at the emergency summit.